Nine out of ten exhibiting companies believe their trade show programs will achieve better results this year according to Exhibitor Magazine’s 2016 Economic Outlook Survey. That confidence among exhibitors may be why 25% of them are making definite plans to invest in a new trade show booth this year. Timinig is everything. Visitors to the recent EXHIBITORLIVE event in Las Vegas were energetically shopping for new trade show displays. Nomadic’s newest modular tradeshow display systems were featured in the New Product Showcase. Our Envision line of trade show displays and our new backlit exhibit design are the only SEG fabric displays on the market that pack into a case that converts to a counter. Exhibitors were enthusiastic about the combination of features: brilliant SEG (silicone edge gasket) graphics, tool free frame assembly and convenient transport. If you were unable to join us, watch our short show video. Or download the hand outs here. For fresh new ideas for your trade show and event marketing program, visit our searchable database of display designs! Ever wonder why humans are attracted to light? It’s actually an unconscious response mechanism rooted in instinct. Light enables us to see better which improves our ability to find food and shelter to survive. Our natural attraction to light is a key reason why LightWall backlit trade show displays and graphics are so powerful at drawing our attention. Unfortunately the expense and installation complexity often put them out of reach for many marketers….until now. With the recent introduction of new LightWall backlit tension fabric displays, Nomadic has created a series of portable display solutions that are both easy on your wallet and easy to use. This 20’ LightWall backlit display packs into just one RollOne Case, with a counter conversion, that ships UPS and FedEx! Backlighting is the hottest trend in exhibit design. LightWall backlit trade show booths enchant, engage and energize audiences because they stand out in a crowded hall. Seamless edge-to-edge imagery lit by true white LEDs boosts overall graphic impact. These tradeshow displays can be backlit on both sides by simply connecting two frames back-to-back. Lights are pre-installed in the frame channel for protection during transit and speed set-up. Frame sections glide together and tighten with thumb screws. The SEG (silicone edge gasket) fabric graphic panel is pressed into the channel of the frame perimeter. LightWall backlit tradeshow displays help reduce your trade show marketing expenses 5 ways. Nomadic’s custom tailored fabric graphics cost less than photomurals. Fabric graphics are more durable and machine washable to last longer. LED lights use less energy and last up to 10,000 hours. LightWall backlit display ship in just one RollCase Case that converts into a counter. Our RollOne Case ships UPS and FedEx. While many exhibitors are satisfied with the service they receive before and during the sale, yet Nomadic ensures customer needs will be met after-the-sale. Light module replacements easily snap into place if damaged in the field. Every LightWall backlit tension fabric display is backed by the industry’s best lifetime warranty. If you’re like many exhibitors – you want it all – great design, easy set-up, durability, compact portability…oh and don’t forget upgrade options. With Nomadic’s newest innovation, now you can have it all. Envision trade show displays make a statement with ultra-sleek style. A trade show display does more than just present a marketing message, it projects an image for your company. Envision trade show displays deliver first class style with ease. 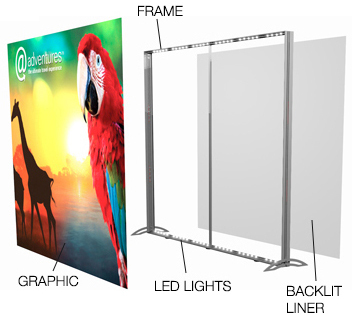 A ten foot Envision display packs complete with accessories into one portable case and sets up in minutes without tools. Envision trade show displays offer more than exhibitors may expect at a cost less than they might imagine. •	A seamless SEG (silicon edge gasket) fabric graphic panel mounts edge-to-edge on a frame with for a crisp finish. •	Choice of upgrades including halogen or LED spotlights, dimensional signage, monitors, a second graphic for double sided use and more. •	Only Envision displays travel complete in an upright case that ships UPS and FedEx. •	Nomadic stands behind every Envision display with a lifetime warranty. •	A 10’ Envision display with a set of lights in a RollOne Case is available at special introductory pricing until August 31, 2015. To learn more about why an Envision display will do good things for you and say good things about you; visit our new product page. Nomadic Display — a leading producer of top-of-the-line custom modular and portable trade show displays hosted a Business After Hours Networking event for members of the Tri-County Chamber of Commerce in its Fairfield, New Jersey showroom on Thursday, October 9. The opportunities presented by a face-to-face marketing event such as this one are invaluable. Chamber members were invited to enjoy refreshments, make new contacts, and network with like-minded professionals in the Tri-County area, ultimately setting the stage for real business growth. The more you learn about another person’s interests and experiences, the more that person will want to learn about yours. Nomadic Display offered attendees a sampling of their most unique exhibit designs, some of which have served as the backdrop for high-profile primetime television programs. At the end of the event, Nomadic Display held a door prize drawing. David Vnenchek of Placements Plus Service (left) receives his prize from Michael Hurley of Nomadic Display, a SignLine banner stand, valued at $480. For help organizing your next business event, contact your Nomadic Display representative today. EuroShop is the world’s largest retail trade fair and it is held every three years in Dusseldorf. This year the show drew over 100,000 visitors from more than 100 countries. Attendees representing companies from new start-ups to global brands were there to view design trends and new solutions from shop fitting and visual merchandising to exhibitions. Nomadic Display was one of more than 2,000 exhibitors this year. It was our tenth time as an exhibitor at EuroShop. Best known as the company that invented the pop-up display, we created a trade show booth design to demonstrate to potential buyers how a popular modular display is suited to retail and trade show applications. Compact and lightweight Nomadic portable displays are the easy way to deliver your message anywhere. From counters, kiosks, and banner stands to pop-ups our best selling trade show displays get attention as stand alone units or combined to form larger selling environments. Trends in trade show displays often reflect design trends from other industries - architectural design, industrial design and interior design. So I recently found myself at NeoCon East, the premier design expo for commercial interiors where renowned architect and product designer, Michael Graves, was a keynote speaker. Attendees were welcomed onto a show floor carpeted in white. Many of the exhibitors also chose white carpet for their exhibit spaces. Even the pipe and drape was white. The dramatically fresh effect made 250 exhibits appear to float on a cloud. Many exhibitors had fabric structures suspended overhead which further added to the weightless atmosphere. Trade shows are always a great place to meet up with customers and NeoCon was no exception. RFM Preferred Seating has owned their Nomadic displays for over 10 years. RFM connected a 10’ Instand® curved model to a 10’ Instand Plus® flat model to create a vista-like backdrop for their colorful range of office chairs where visitors were invited to take a seat. When not out on the show circuit, Kevin Posch, Marketing and Sales Manager, loans them to other offices or has them “sit proudly” in RFM’s showroom. Unicor placed graphics on the rear of their Nomadic Instand® display and incorporated the wall into the office setting that was their exhibit. Unicor office furniture products are made in America by inmates confined within the Federal Bureau of Prisons. DeLoran Lyles, Trade Show Coordinator, reported that their corporate management team was very positive about the show this year and plan to attend again next year. 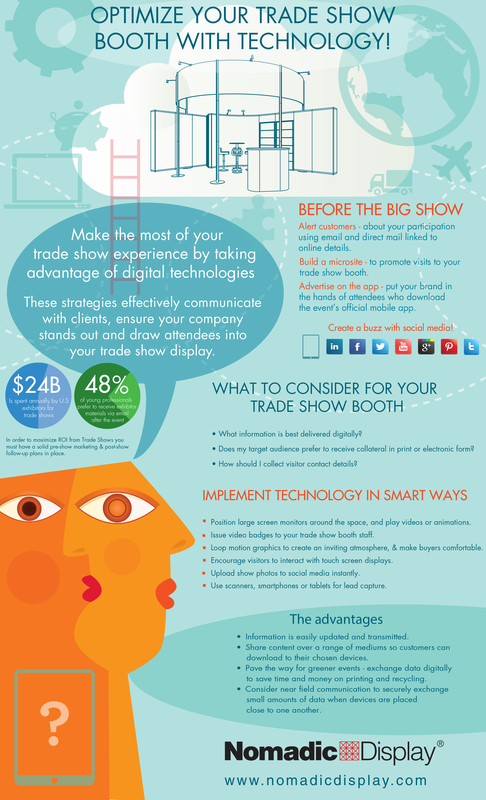 Trade shows and television programs have a lot in common. Think about it. They both require advance planning and preparation, even rehearsals. Both depend on audio and visual communication to connect with their audience. Both involve face-to-face interaction. And both use Nomadic displays to stage their program! Most recently producers at Intereconomía TV called on Nomadic Display Espana to design and build the tv set design for their program, Noche de Boxeo, or Boxing Night. Noche de Boxeo was created to offer the best live boxing broadcasts. For a first class program producers envisioned a striking tv studio set design for commentators that would portray a premium quality experience for tv viewers. In addition, the show is scheduled between two other live broadcasts in the same tv studio set so it had to be installed quickly. Nomadic built ten foot tall Instand pop up frames and covered them with colossal photo graphics of boxing images. Frames were arranged in an L shaped wall to allow television cameras to shoot the hosts and panel from two open sides. Not only was the set-up remarkably fast, but it was also far more cost effective than standard television sets. The program captured the channels’ top slot for audience viewership and is a big hit in Spain racking up over 7,000 likes on Facebook. Professional boxers were among the commentators on the debut program including Javier Castillejo, considered to be the best Spanish boxer in history. Beatriz Pino, who is the host of the program is the first woman in Spain to direct a boxing program. Recent broadcasts included matches from Chicago and Atlantic City. This wasn’t Nomadic’s first television rodeo. We’ve designed tv studio sets for NFL and Fox Network sportscasts. Often transported from stadium to stadium, their set designs needed to be easy to assemble and durable. So Nomadic created custom back drops with network brand graphics printed on durable tension fabrics that look great and stand up to rigorous use. Sports television sets like these join other tv set designs Nomadic has produced for entertainment television broadcasts. They include American Idol, America's Got Talent, Britain's Got Talent, and X Factor as well as cable tv talk show set designs.